I am not sure what to write about this one. 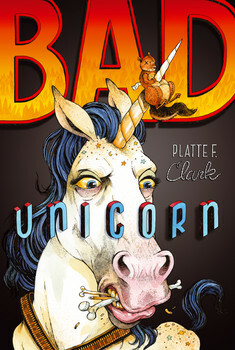 I received Bad Unicorn as a donation from a parent at our annual book sale at our school and the title and the cover got my attention. As is usually the case, I took it home to read aloud with my youngest son. Apparently, this is the first in a trilogy by Platte F. Clark. It tells the story of Max, who has found a magical book that can give him incredible powers. Meanwhile, the world itself has been “sundered” into three zones, with our Earth as we know it just one of those zones. Bad Unicorn, aka The Princess, comes from another zone, and she has been sent on a mission to kidnap Max and the book, and bring them back to a bad wizard. Needless to say, the unicorn in question is not nice. She is a destroyer, full of powerful magic and a nasty attitude. Oh, and she likes how humans taste, so she is motivated on her mission because she is promised the state of Texas for lunch. Meanwhile, there are these dragons, disguised as humans … and the story gets way too convoluted to explain here. There are echoes of every adventure story you have read in Bad Unicorn. I can’t decide if that is good or bad, however.